One of the most unexpected comic book crossovers of the year is also one of the most entertaining. You all know the kids from Riverdale, the squeaky-clean teens whose hijinks have filled digests for decades. Well, their adventures continue, complete with the Archie-Veronica-Betty love triangle, Jughead's healthy appetite, Reggie's vain good looks and a very special intergalactic hunter dropping in to kill some time. It's your next guiltless pleasure, Archie Vs. 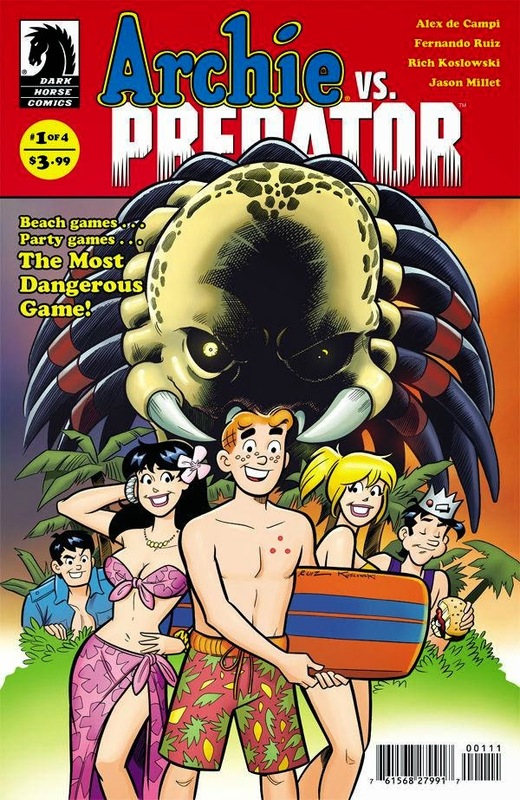 Predator #1 from publishers Dark Horse Comics and Archie Comics. It's time for Spring Break and the gang is headed to a lush resort thanks to Jughead's winning ticket from a bag of potato chips. The usual complications arise between Betty and Veronica vying for Archie's attention, yearbook awards aren't done yet and oh yeah, a mysterious streak in the sky is actually the Predator's spaceship landing on the jungle-like island. Alex de Campi creates a very familiar story for Archie and friends with slight nods to the 1987 cult classic sci-fi film ("I'm a gosh-darn sexual tyrannosaur...!"). It's the perfect set-up as the issue eventually gets very bloody complete with skinned bodies dangling from a tree. Although, for the record Veronica drew first blood. No one seems safe as the Predator will be hunting them down in this four-issue miniseries. Longtime Archie artist Fernando Ruiz draws the classic characters in their usual form which makes the violence all the more jarring. Ruiz is just getting started too. The digital display on the Predator's bio-mask is pretty clever consisting of emojis and for some reason enjoys the Veronica-Betty brawl giving them two check marks, a heart face, OK sign and keeping it 100%. Along with Rich Koslowski and Jason Millet, Ruiz creates a vibrant and colorful landscape of panels full of energy and humor. It's an inviting introduction into Archie's world right as it intersects with the galaxy's deadliest hunter. The 'Sabrina Meets Hellboy' extra by de Campi and Robert Hack at the end is a hoot too. Archie Comics has proven it isn't afraid to innovate and take chances. Their Archie reboot will take on a more contemporary feel and look under Mark Waid and Fiona Staples. Afterlife with Archie and The Chilling Adventures of Sabrina under their new horror imprint has produced some genuinely fantastic suspense and thrills by reimagining classic characters and putting them in some serious danger. This new crossover is a delight for longtime fans of both properties. Even if you're not an Archie fan I'd especially recommend it because if you do like "teenagers in peril" horror flicks then this is the comic for you. Go ahead and indulge in your urge to see the Riverdale gang get slaughtered. It should be a blast.